Stay connected on Alaska Airlines. Alaska Airlines has selected Gogo to provide next-generation satellite-based inflight Wi-Fi service across its entire Boeing and Airbus fleet. Gogo’s broadband 2Ku service provides the significantly faster connection speed needed to stream content from services like Netflix, Hulu, and HBO GO while in the air. Utilizing this advanced technology, guests can use their devices in flight just as they would on the ground. The Gogo 2Ku service will be installed on Alaska’s Boeing 737 aircraft beginning in the first half of 2018, with 40 to 50 planes expected to be completed by the end of the year. The remainder of Alaska and Virgin America’s mainline fleet will be fully satellite Wi-Fi equipped by early 2020. Regional jets operated by Horizon Air and SkyWest, which serve shorter flights, will continue to offer Gogo’s ATG4 internet service (including Free Chat) along with free movies and TV. If it sounds incredible, that’s because it is: Internet access at your fingertips, while traveling at 500 miles per hour through the troposphere. But eight years after in-flight Wi-Fi became commercially available in the U.S., the service is so commonplace and commonly frustrating that it’s become fodder for jokes, rants and countless Tweets. That disconnect can be frustrating, and Lapin and others who work on the airline’s in-flight connectivity know it. That’s why they’ve spent the past year adding resources and have just started to retrofit most of Alaska’s fleet of Boeing 737s with a new solution that will improve the bandwidth currently available on Alaska flights. Today there are two ways to deliver in-flight internet: from the air, via satellite, and from the ground, via cell towers. Satellite offers more bandwidth, while air-to-ground offers quicker response times; it’s a delicate balance. Alaska’s planes have been outfitted with an air-to-ground (ATG) solution from Gogo since 2010. Gogo-equipped aircraft have antennae that communicate with Gogo’s ground network: more than 225 cellular towers throughout the U.S., Alaska and southern Canada that point up toward the sky. 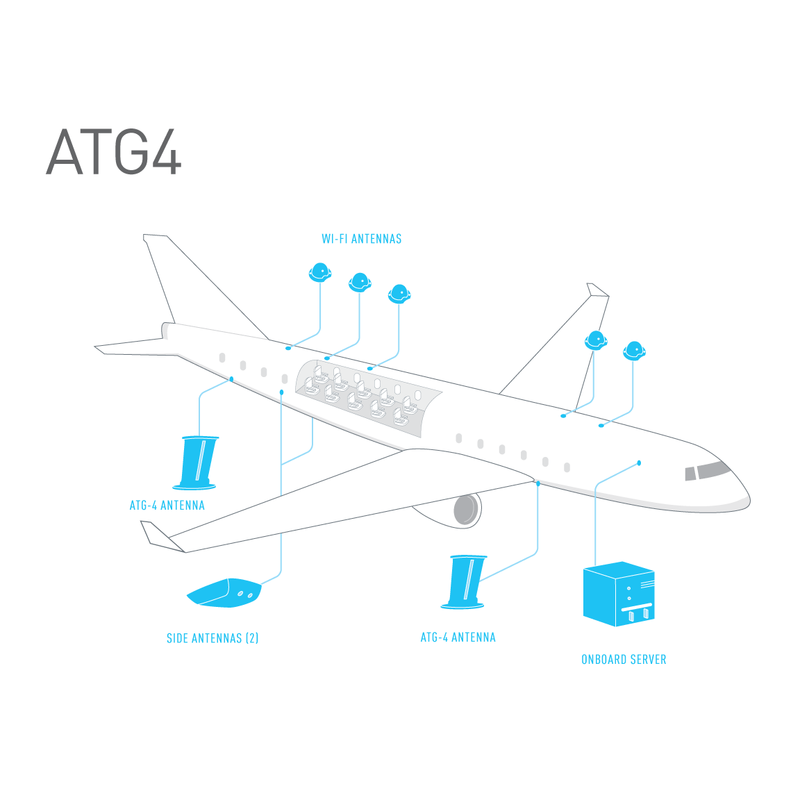 As the fleet is upgraded to the new solution called ATG-4, each plane will be outfitted with an additional two antennae (for a total of four) and a second modem. While the airline isn’t ruling out satellite as a possible future solution, Alaska is acutely aware of the challenges in providing coverage across its diverse route network. Similar to cell phone providers, each in-flight Internet provider has its own coverage map. No other major airline flies as many customers in the state of Alaska, where coverage options are tricky due to curve of the earth relative to satellite orbits. Coverage over the Pacific Ocean to Hawaii is also limited as most satellites are developed for multiple industries to leverage (such as home users in rural parts of North America) and there just aren’t that many people out in the middle of the Pacific – just a handful of jets and some maritime traffic. “We’re not just looking for faster service on next Tuesday’s flight from Seattle to Boston – we’re looking for a solution that sets us up for success for the next 15 years,” he says. 4 comments on "The ins and outs of in-flight connectivity"
Always enjoy the free inflight entertainment especially on the transcontinental flights. So we shouldn’t expect wifi to Hawaii? That’s where it would be nice to have it the most since it’s a long flight. I, for one, fully welcome ANYTHING that will make connectivity, and thus speeds better. I fly twice weekly, and often have to respond to urgent things via email. Working at places like hospitals that don’t close, they expect you to be available all the time. So when I’m on a flight that WiFi is horridly slow, it really gets frustrating. I’m typing this from somewhere over Sacramento, and am happy to say that for some reason, today’s WiFi is actually useable. Client emailed me something urgent, and I was able to log into their VPN and fix it for them. So here’s to patient safety (what I just helped my client achieve from 36,000 feet), and to better WiFi from here on out! It’s very possible you are flying on one of our upgraded ATG4 planes! Glad to hear the Internet is working well for you today.